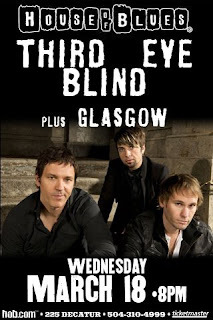 Local indie rockers, Glasgow, will be opening for 90's pop rock sensation Third Eye Blind this Wednesday @ House of Blues. Its always a pleasure to see one of the local indie rock bands take the main stage at HOB. Afterwards, head straight across the street for Glasgow's Afterparty at Attiki where the boys will be hanging out to the wee hours of the morning.